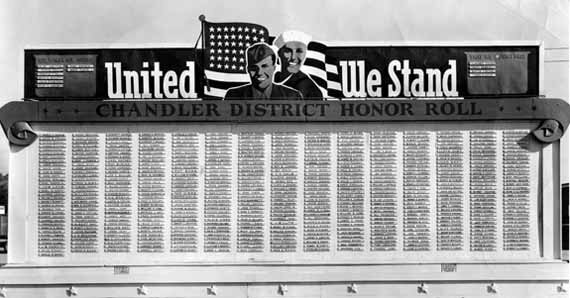 As the U.S. began sending troops to the faraway battlefields of World War II, Chandler citizens and the American Legion decided to create a physical reminder of the men and women in their community serving the country. They chose to construct a large sign that would list individuals from Chandler, Goodyear (now Octotillo), Higley, Queen Creek and Chandler Heights. With money raised from the community, the American Legion hired Pedro Guerrero, a Mesa sign designer, to create the Chandler District Honor Roll. In only ten days, Guerrero and others built a monumental wooden sign 16 feet high and 30 feet wide, which stood in the southeast section of this part. Dedicated on May 30, 1943, the names on the sign grew from 330 to more than 700 by the end of the war in 1945. After the war, veterans requested a permanent memorial to replace the Honor Roll board. On Memorial Day in 1949, the American Legion dedicated a stone monument with a bronze plaque reading, "Dedicated to those of the Chandler Community who have service in the Armed Forces of the United States so that peace, freedom and justice might not perish from the earth. Today, that memorial is located on the east side of A.J. Chandler Park. "For those whose names will appear on the Roll of Honor, it will carry the assurance that the community will continue its support of the war effort -- and their names will be proof that their home town will not forget them - ever." Download the complete list of names on the Chandler Honor Roll. Jensen, Edythe (July 5, 2006). "Chandler's veterans 'honor roll' likely lost: Search for it began 20 years ago" The Arizona Republic. Retrieved September 14, 2011. Browse ChandlerpediA/People/Veterans/World War II/Cluff, Ivan L.